In October 2013, BUiLD assisted 13 UTS Interior and Spatial Design students to take an international design studio subject in New Zealand at the Christchurch Festival for Transitional Architecture (FESTA). This studio involved 2 design briefs; both looking at the same site: the Worcester St Bridge which forms the entrance to the city of Christchurch. The first brief was an individual project to redesign the Worcester Bridge. This bridge was the site of the first encounter between the Maori people and Europeans. The location is an enterance to what was the CBD prior the earthquake. The axis is punctuated by the museum on one end and the Cathederal on the other. Brief two was to develop temporary architecture on Worcester Bridge as part of Free Theatre’s production of Canterbury Tales as part of FESTA (Festival of Transitional Architecture). The production involved a procession of oversized puppets visiting sites. The students’ site was the disaster; the earthquake. It was a 2 days festival, with the procession planned for both nights. The design had be visible and engaging in daylight and at night. 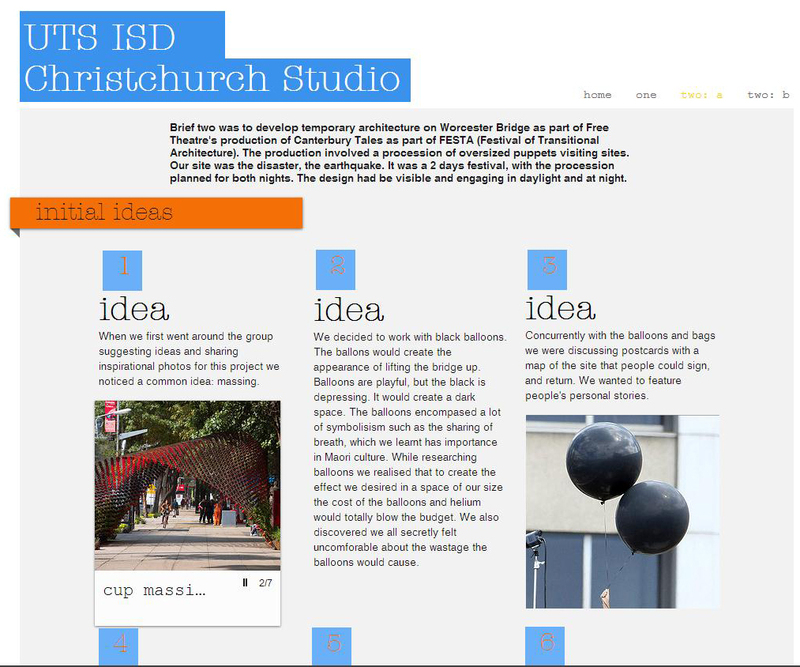 You can read more about the Christchurch FESTA Design Studio, see images and ideas from the trip on the blog created by the students.